Kinkajous are mammals native to the rainforests of South and Central America. These animals are arboreal, which means they live and forage in trees. This may be the perfect place for them to live, because kinkajous love to eat fruit! 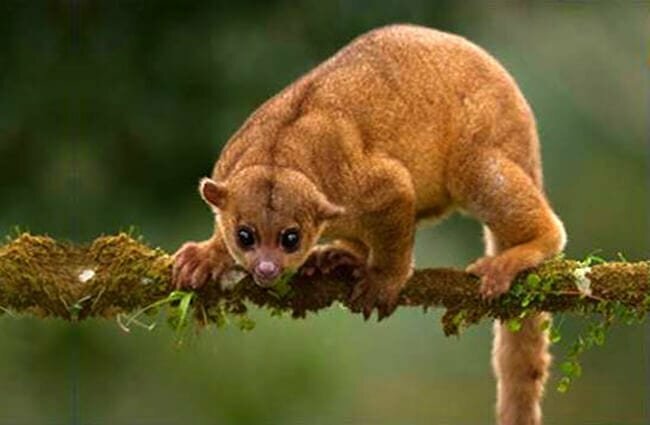 Read on to learn about the kinkajou. These climbing mammals have wooly fur that consists of a top (outer) coat, and a bottom (under) coat to keep water out. Their fur is a gold color, and the undercoat is gray. Kinkajous have round ears, large eyes, and sharp teeth. They also have a long, prehensile tail that they can use to grip branches. Not only are kinkajous adorable, but they are also actually incredibly interesting animals. They hold a very specific niche in the rainforest, and have many adaptations to utilize their habitat. Non-Carnivorous Carnivore – Because kinkajous have sharp teeth, they are part of the taxonomic group Carnivora. 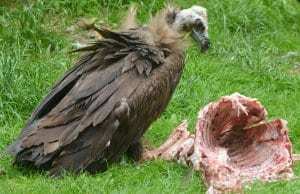 Most animals in the Carnivora group are, as you may guess, carnivores. Kinkajous however, are actually herbivores. Fruit makes up the vast majority of their usual diet. 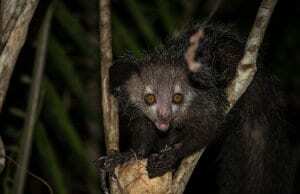 Arboreal Living – Kinkajous are amazingly adapted to living in trees. They have a fully prehensile tail that they can use as a fifth “arm” to grip branches with. This tail allows them extra stability while climbing. They can also rotate their feet 180º to better grasp branches. This allows them to move backwards on branches, and climb down trees headfirst. Nocturnal Behavior – As nocturnal animals, Kinkajous are most active at night, putting their large eyes to work seeing in the dark. Most of their foraging occurs between sundown and midnight. As you would imagine a tree climbing animal might do, when the sun comes up kinkajous choose a nice tree hollow to nap in. Long Lived – When kinkajous are in human care they can be quite long-lived. 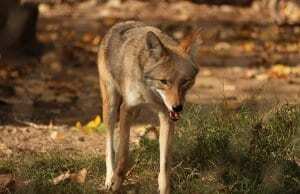 This is because they are safe from predators, and have access to medical care. The average lifespan of a kinkajou in captivity is 23 years. 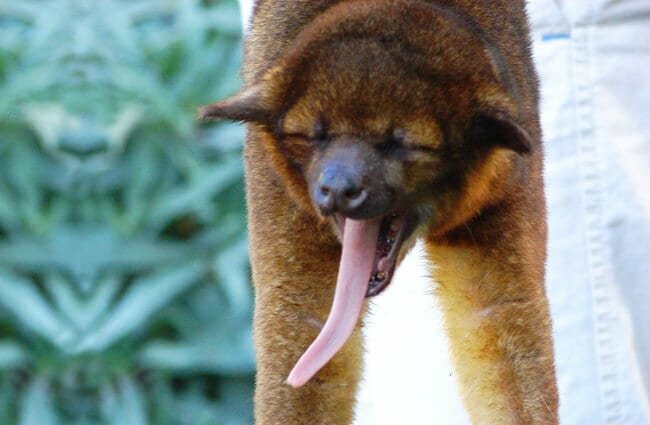 The oldest recorded kinkajou was a 40 years old male named Sugar Bear at the Honolulu zoo. Because they live in trees, habitats must have forests to support kinkajous. 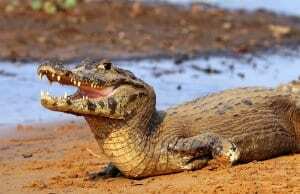 They are found in tropical rainforests, mountain forests, dry forests, and small sections of forests found on the edges of savannahs. 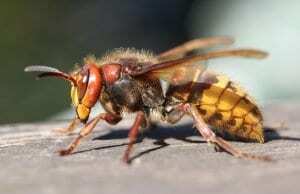 They will congregate on fruit bearing trees, despite being mostly solitary animals. Kinkajous are found from the Sierra Madres mountain range in Mexico, to Southeast Brazil. They are not found west of the Andes Mountain range in South America. 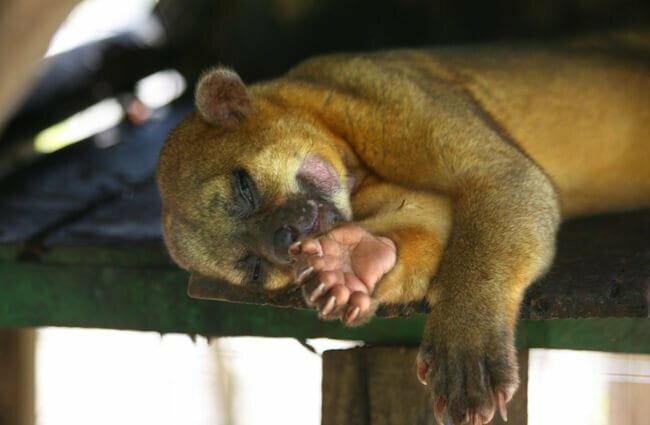 The vast majority – 90% – of the food a kinkajou consumes is fruit. They particularly enjoy eating figs. Because they eat so much fruit, they play an important role in seed dispersal. Because trees reproduce via seeds within fruit, when a kinkajou eats a tree’s fruit, what goes in must come out! If a kinkajou eats a fig, and then “releases” the seeds a mile away, that allows trees to spread in a farther range. As with many other rainforest species, deforestation poses a huge risk to kinkajous. As rainforest is cut down, vital habitat is destroyed and kinkajous have fewer trees to live in. Deforestation also causes population fragmentation. 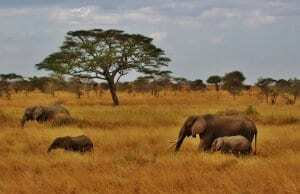 When populations are separated by large, impassable areas, animals cannot reproduce between the populations. 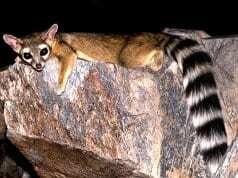 This means that kinkajous in fragmented habitats are more likely to reproduce with a close relative, causing genetic defects. While kinkajous are kept as pets, they are wild animals and have not been domesticated. 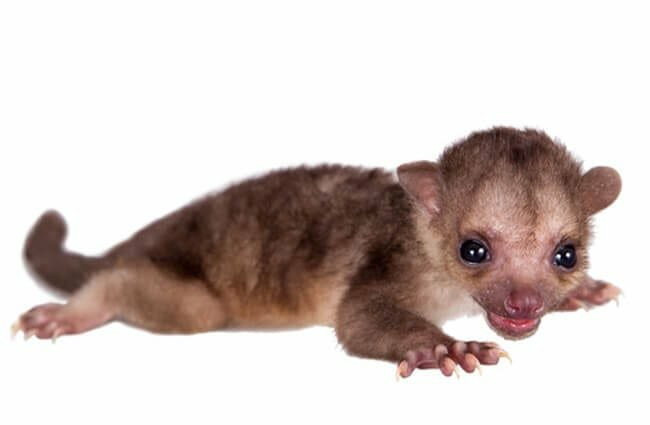 In some states it is legal to own a kinkajou. Even if it is legal, owning a kinkajou is hard work. 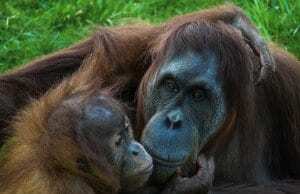 They require lots of fresh fruit for their diet, and it must be human grade to keep them from getting sick. Veterinary bills are much higher for exotic animals, and procedures are more dangerous. Kinkajous are also nocturnal, and may very well keep you up at night. 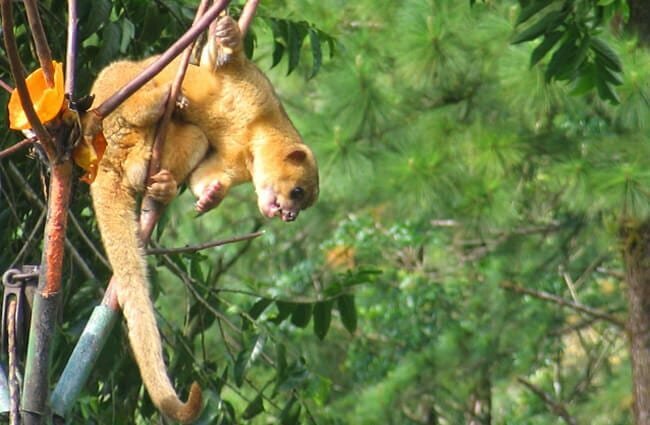 As arboreal animals, kinkajous must be provided with plenty of climbing opportunities. 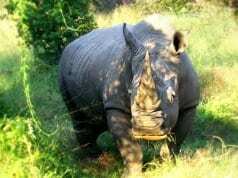 They are most active at night, and must be provided with food and exercise at that time. A variety of fresh fruit should be provided, and kinkajous are frequently supplemented with dog kibble, corn, and other veggies. Kinkajous are social, but only on their terms. They are mostly solitary, but will gather when feeding on fruit trees. They will occasionally gather for socialization and play, grooming, or sleeping together. They tend to remain in a territory, but they don’t always live in that territory alone. 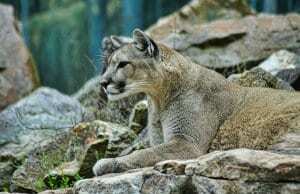 They use scent marking to establish territory boundaries and communicate with one another. After reproducing, a female kinkajou gives birth to a single baby. She will make her nest in the hollow of a tree, and leave the baby while she forages for food. She will begin to feed her baby solid food at eight weeks, and he will begin to climb at three months. 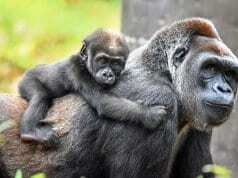 Males will remain with their mother a little over a year and a half, females will stay for two years. Weight 3 – 10 lbs. 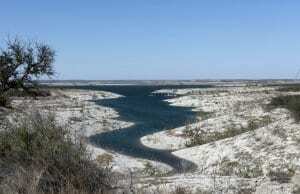 Habitat Rainforest, mountain forests, dry forests, etc.